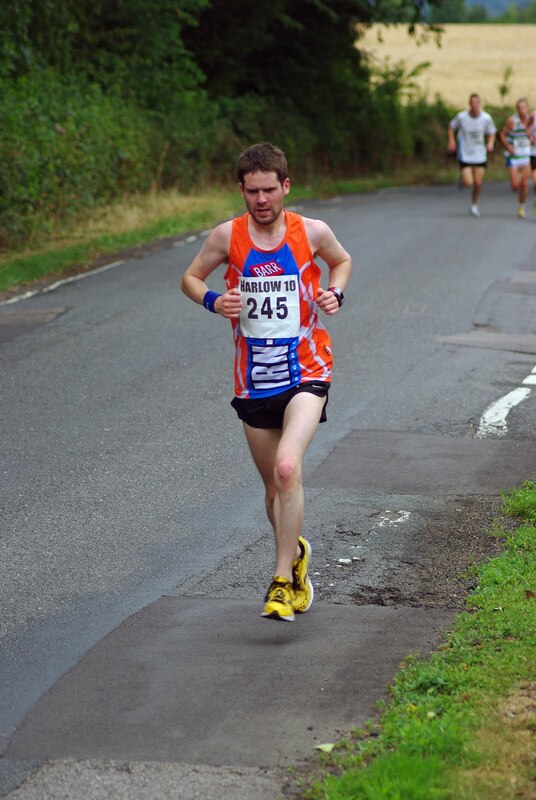 On Sunday I was Essex bound for the Harlow 10 Mile race. I had never run a 10 mile race before so this was a good chance to test myself at this distance. It would also be good preparation for the Great Scottish Run in September, which being a half marathon is 13.1 miles. I really felt that I’d started far too quickly was really flagging by the 4th mile, before the halfway point! This was reflected in my mile split times but I kept on battling. I’d never stopped during a race and I was planning on getting into the habit today! Somehow I got a 2nd wind for the last 3 or so miles, even posting my fastest mile split in the last mile. If only I’d had that much energy halfway through! It’s always easier when you know the finish line is within reach though. I even managed a sprint finish, and yet again almost caught the runner in front on the line but he just hung on. I finished in 11th place in 58 minutes and 25 seconds. In the end I was very happy with my time as it was above my expectations before the race, even if I’d hoped for better than 11th place. It also suggests that I should have a very good chance of posting a sub 35 10K time! Home course provides another 10K PB! 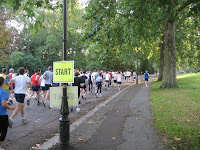 A very early start on a sunny Saturday morning for this ‘Self Transcendence 10K’ in Battersea Park. Races tend to be on a Sunday which allows me to have one or two beers (and yes I actually mean one or two) on the Friday, so I was quite disciplined going to the pub but abstaining completely. 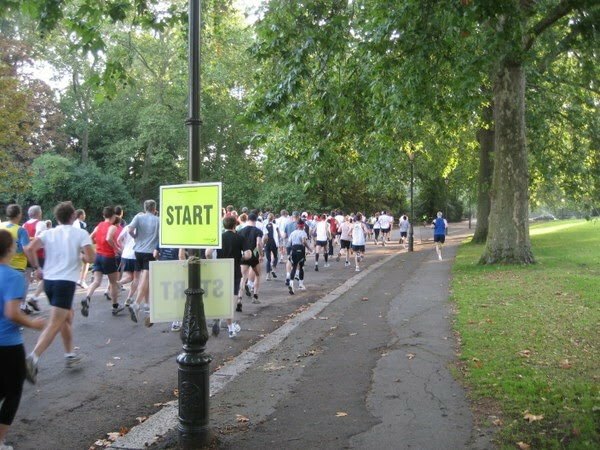 I do a lot of my training in Battersea Park so I'm pretty comfortable with the surroundings and the course is as flat as a tattie scone. This gave me the confidence that I was well capable of a PB. However, I didn’t have the ideal preparation for this 8am 10K. After missing my train by about 30 seconds, I had a 2 mile run on my hands (well my feet), just to get to the start line! My initial thoughts were that this could cost me 30 seconds in the race! It would be a horrendous start to the weekend if I missed this though so I wasted no time and made it to Battersea Park just in time for registration, 15 minutes before the race was to start. There looked to be quite a few serious club runners around me so knew I’d have a battle on my hands. My main aim was to get closer to that elusive sub-35 minute 10K though. I went out pretty quickly with the leading pack, but soon a few runners broke off and I was left to fight it out with one runner. Just like my previous 10K race I was in another battle and we pushed each other hard. I let him dictate the pace though as I felt I’d went out a bit too quickly. I kept covering any distance he pushed forward but I thought I was struggling. As always the battle was now body against mind. The course consisted of approximately 4 laps of the park so it was quite monotonous at times, but I’m used to doing 20-odd miles round there so I pushed on. I could still see my fellow runner going into the final straight but still had a bit of distance between us. I always have a wee bit left in the tank at the end of 10Ks though so I hit the boost button and then with a sprint finish that Linford Christie would have been proud of I pipped him to the post! We actually ended up with the same official time but I stole the 6th (I didn't actually know what position it was at the time) position with the proverbial head. I was pleasantly surprised to learn that I’d finished in 6th and that 1st – 7th men received a trophy which is above. More importantly I skimmed another 20 odd seconds off my PB and not far off that sub-35 10K! That's also my third 10K PB of the year and I don't intend to stop now. So altogether a great morning. Unfortunately there are no photos from this race yet but I’ll post them when they appear. Podium Finish and Smashed 10K PB! I'm now well into my training for the Great Scottish Run and Loch Ness Marathon in the Autumn but I'm still desperate to cut down my 10K time. I haven't done a 10K race since February so it was time for another crack. I’ve done a vast amount of training since then for the marathon so I knew I had a decent chance of a PB. 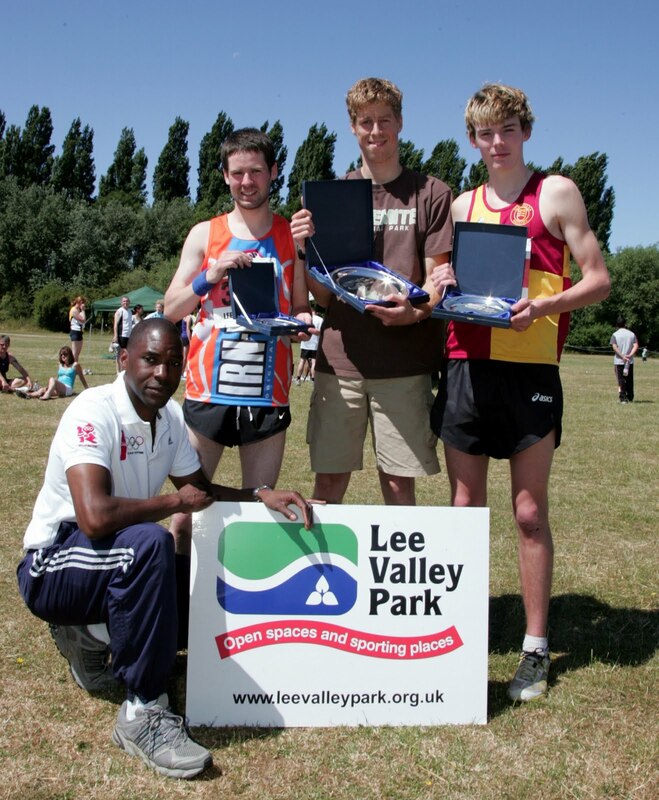 My chosen race was set in the beautiful surroundings of Lee Valley Park, in Waltham Abbey in Essex, on a gorgeous hot summer's day. 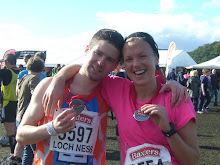 Entering these kind of races is a great opportunity escape the hustle and bustle of the city and is a great wee day out! It was a very well organised event and I particularly enjoyed the classic tunes they were playing out of some speakers before the race. They included all the classics I listen to on Real Radio and Gold FM so it got me relaxed at the start! 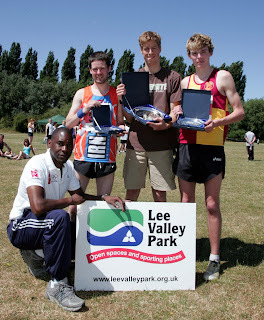 The race was started by Mark Richardson, Olympic silver medallist and World Championship gold medallist no less! As I tend to do, I got away very quickly and I was in fact a bit of an early pace-setter. I led a group of about 5 runners. We were going at a very fast pace of around 3:20 mins per km and I knew I was out of my ‘comfort zone’. By the 4K mark I had started slowing a little and the eventual winner of the race sped off into the distance at around this point. Then I started a battle with the remaining runner. We were pushing each other very hard and stealing the lead off each other at various points. It was pretty epic! Somehow I got the energy to push away and tried to get a comfortable distance between us. But then a guy from the original pack came from nowhere (you can see him in the pic above), he must have been saving his energy for the last km or so! I tried to battle back bit it was no good. At this point I was most concerned about where the guy behind me was as I was determined to hold onto 3rd place for a podium finish. Then I saw the finish line and hit the boost button as you can see in the above pic. It was some sprint and I was so close to catching 2nd place – came within a second! And although I didn't even get a glimpse of him for the 2nd half of the race, I was only about 30 secs off the winner. I would have taken 3rd place before the race though and I was more delighted with smashing my 10K personal best, finishing in 35 mins and 48 seconds. There were a number of special aspects to this race. Firstly, I smashed my PB and did my first sub-36 minute 10K. Secondly I achieved my highest position in a proper 10K race. And thirdly, I actually won a silver plate, presented by Mark Richardson. As you can see from the photos of the presentation, I was a very happy boy!